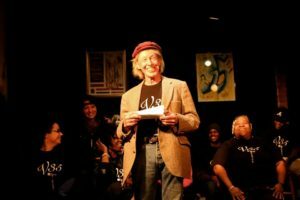 Acting for Poets is an educational program designed for poets who want training and experience in theatrical performance of poetry, their own as well as others. Conceived and directed by D.D. Delaney, The Venue’s Artist-in-Residence, the program offers weekly workshops for poets to present their work and receive coaching on effective techniques for improving their performance. Workshops in the past have been theme-related, culminating in public performances of poetry generated over many weeks, including Conversations Among Poets on Race, Death, Love, Politics, and Religion, each playing for a weekend at The Venue between 2015 and 2017 under the ensemble name The Venue Voices. A current project is underway to develop a Venue production of one of Shakespeare’s Roman plays next summer, 2018, on The Venue’s outdoor stage.